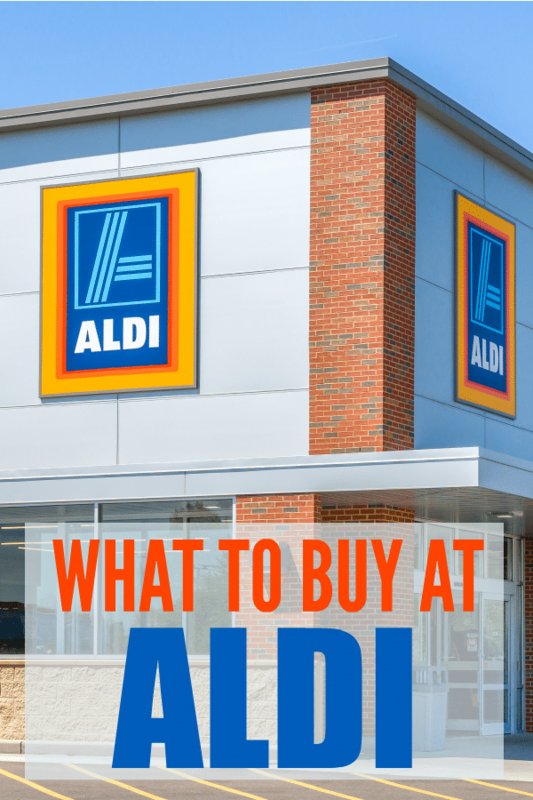 If you’ve heard of this “bargain” grocery store, but haven’t visited yet, make sure you start with this list of what to buy at Aldi. There are indeed, many great deals, but you’ll see the true value of shopping in this unique market by purchasing a few basic staples. Aldi is well-known for being a great grocery store for those on a budget. The problem is that many people have no idea what to buy at Aldi. Most of the items in Aldi are private label brands. If you’re the type that’s used to buying brand name products, you may be scared to try something new. Let this list be your guide. There are lots of good buys to find and you’ll spot many of them just strolling the aisles. If you like to shop with a plan though, here’s a list of what to buy at Aldi on a regular trip. You’ll usually find that Aldi has some of the best prices when it comes to milk and eggs. These are items they use to get people in the door. If you don’t buy anything else at Aldi, at least buy the milk and eggs. Even the unsweetened almond milk has a great price that others stores simply can’t compete with. Aldi is one of the best places to find organic foods at an affordable price. They offer organic foods in almost every department. If you’re concerned about the food you’re feeding your family, consider trying a few of the organic foods from Aldi. You can find awesome deals on fresh and frozen produce from Aldi. The only thing you need to remember with the fresh produce is that you need to use it quickly. The prices are excellent, but this isn’t the type of produce you can store all week. In the freezer section, you’ll find awesome deals on frozen organic fruit that is wonderful in smoothies. Canned foods can also be a great price. Unless it’s the holidays, you’ll be hard pressed to find canned beans, corn, etc. for a cheaper price. During the holiday season, you can find so many awesome specialty foods at Aldi. People go crazy over their specialty cheeses, candies, and cookies. You’ll find a number of imported baked goods and treats from Europe. This makes throwing a holiday party super easy and affordable. They even have you covered when it comes to holiday gifts. Something else you’ll find during the holidays is a huge selection of baking supplies. During the rest of the year, you can still find your basic baking supplies at affordable prices. This includes sugar, flour, baking powder, etc. Last, but not least, spices can also be a great buy at Aldi. Spices can be found for $0.99 a bottle. If you’re restocking after cleaning out your old spices, this is a great place to find many of the spices you need for very little money. During the holidays, be sure to grab those spices that are usually very expensive, such as ginger. Aldi is an amazing place to shop. The trick is to get in there are try items that others have recommended. You can then venture into trying other items. Don’t be afraid of the private label brands. This allows the store to bring you great prices on good-quality food. Where else are you going to find organic food for such low prices?